Hobbs & Murphy, CPA has been in business since 1994. 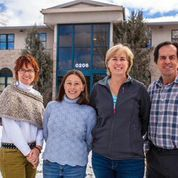 We are a local Basalt, CO CPA Firm providing business and individuals in Western Colorado and throughout the country with tax and accounting services. We know our small business owners take pride in their business - and we do too - which is why we work hard to reduce your expenses and increase your productivity. We also take our knowledge in savings and translate that to reliable tax services to help our individual clients maximize income and minimize taxes. Interested in seeing how Hobbs & Murphy, CPA can help you with your tax or accounting needs? Give us a call at 970-927-8510 to schedule your free initial consultation. We look forward to working with you! Tim specializes in tax and business consulting services for Construction, Real Estate and service industries. Tim is licensed as a Certified Public Accountant in Colorado. Tim received a Bachelor of Journalism degree from the University of Missouri and a Master of Business Administration with an accounting emphasis from the University of Colorado. Tim started his career in public accounting with Price Waterhouse in Denver, Colorado. Tim worked in the audit department at Price Waterhouse that specialized in start-up businesses and gained exposure to the accounting needs of a wide variety of industries. Tim worked for several years after Price Waterhouse as controller for a start up restaurant franchisor. The last 20 years Tim has worked in taxation. Tim is a member of the American Institute of Certified Public Accountants, the AICPA, and the Colorado Society of Certified Public Accountants. Dyan Murphy is a graduate of Purdue University. She began her career working in private industry as an accountant for small businesses in Indiana and Colorado and thought she would never want to work in public accounting because CPAs were just too stuffy. But a move to Maui and an opportunity there with a small CPA firm changed all that. She loved the contact with clients, variety of work, and challenges involved in resolving small business and tax issues. Returning to Colorado in the late 1980s after a year in ‘paradise,’ Dyan decided to become a CPA after all. She got her CPA license and has been practicing ever since. She loves helping business owners solve their accounting, business, and tax problems. Dyan and her husband Mark have raised 3 boys in the Basalt area and both are very involved with the Boys Scouts and Church. She is a member of numerous organizations including the Colorado Society of Certified Public Accountants, American Institute of Certified Public Accountants (AICPA) and the Basalt Chamber of Commerce.